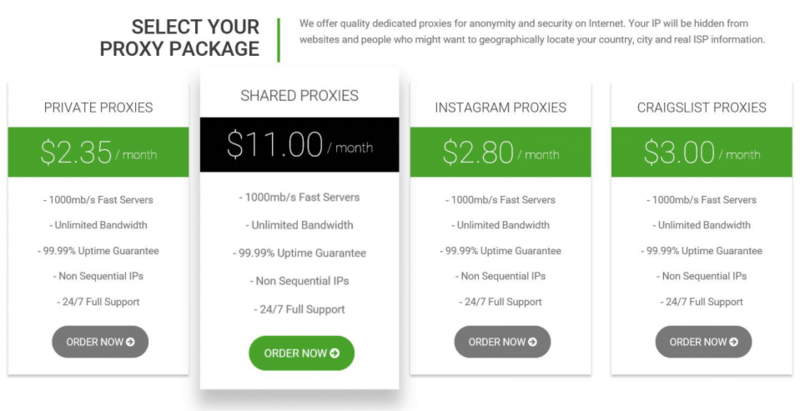 Proxy-n-VPN Review 2019 - Does Proxy-n-VPN proxies working for IG? Proxy-n-VPN is offering private proxy service suitable for general purpose as well as for specialized cases. You can use their proxies to access any sites as well as ticketing, coping sneakers or web-scraping. Their proxies support Craigslist ad posting. One of the most important things in many online businesses nowadays is to have a proxy service subscription. A proxy service lets the business access different sites for marketing, advertising, shopping, and many other sectors. which often do not allow multiple accounts for an IP. Founded in 2012, Proxy-n-VPN is one of the proxy providers who provide VPN service as well. With the motto of ‘protecting the online privacy and security of its users,’ Proxy-n-VPN offers highly anonymous dedicated proxies and secure VPNs that come with many other features. Although Proxy-n-VPN offers both proxies and VPNs, our review series is especially focused on proxies – private proxies, to be more specific. So, we’ll only cover the review of private proxy service provided by Proxy-n-VPN in this article. 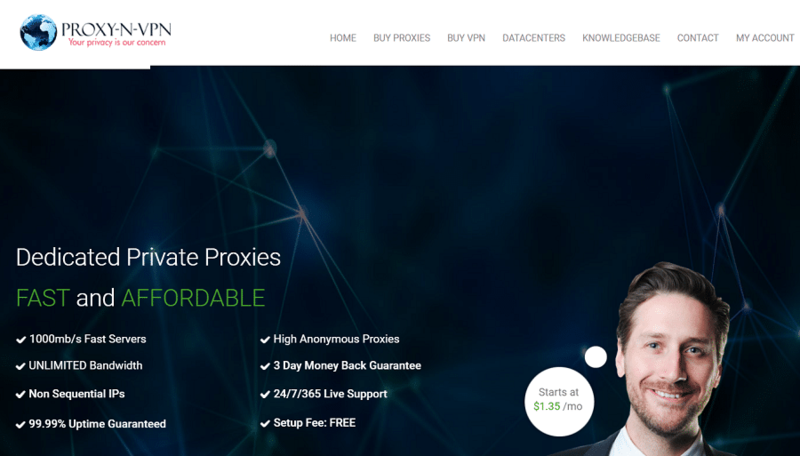 To carry out this review and understand the overall performance and user experience of ‘Proxy-n-VPN,’ we purchased a package of 10 private proxies from them. The proxies were bought solely for review purpose, and there is no affiliation with ‘Proxy-n-VPN.’ After using the proxies for over a week, we have found some features of the service that we liked very much while some aspects also came to our attention which did not impress us at all. Fast and dedicated high anonymity HTTP/HTTPS proxies. Diverse packages of private proxies, ranging from a single proxy to up to 1000 proxies with dedicated proxy plans for Instagram, Craigslist, Ticketmaster, Gaming, and Shopping. More than 30 datacenters located in the USA and Europe. Both IP authorization and username-password authorization are supported. Dedicated control panel for managing proxies. Proxies are delivered immediately after payment. Payment via credit cards is accepted as well as PayPal. Does not let users have trial usage before buying proxies. of locations for the packages is not disclosed. The refund policy is not user-friendly. Specific locations cannot be obtained. Does not allow custom packages. Does not disclose the number of locations in a package. As mentioned earlier, Proxy-n-VPN offers both proxies and VPNs. They also have both shared and private proxy packages. They offer some specialized packages too for specific purposes such as Instagram, Craigslist, Gaming, Ticketmaster and Shopping. Other than these websites, their general-purpose private proxies work very well across the internet. The pricing structure of Proxy-n-VPN is excellent and is user-friendly. Unlike many proxy services out there who do not offer single proxies, Proxy-n-VPN lets you buy a single proxy for only USD 2.35. They have other packages as well, ranging from small to medium to large. You can buy up to 1000 proxies for a price tag of USD 1390, which compared to some other services, is very inexpensive. 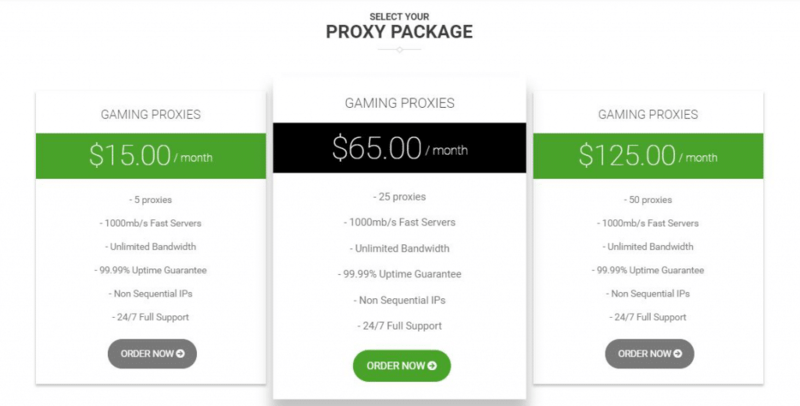 The pricing plans of the proxy packages offered by Proxy-n-VPN is given below (as of October 2018). Although Proxy-n-VPN boasts a total of 30 datacenters in the USA and Europe, they are mostly located in the USA. They don’t mention the number of locations given in each proxy packages in their pricing plan or features description. However, we received proxies in two different cities in Europe while the rest of the IPs among the 10 private proxies were located in the USA, which is pretty standard. They list all of their datacenters with hardware configurations and server status on a page on their website. There is an interactive map too, which shows the servers at that location and their details. 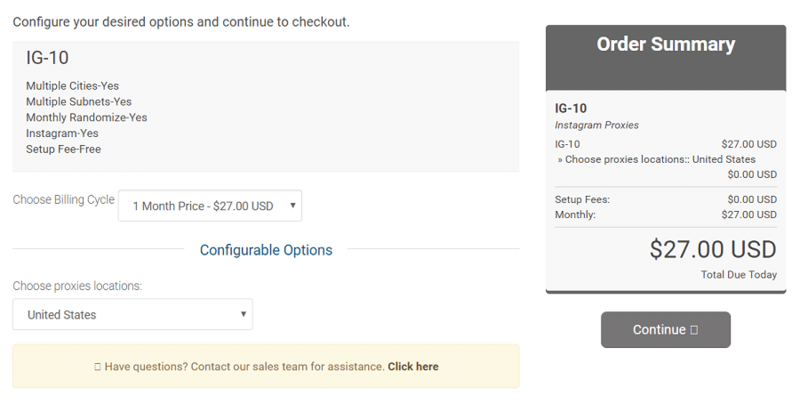 To perform a series of tests, we purchased ten IG proxies from ‘Proxy-n-VPN.’ Four standalone tests were carried out on the proxies to find out how the service performs. Among the tests, the first was to test the network latency. We used whoer.net to check the ping of the proxies in prominent locations in the USA, Canada, and the UK. Depending on the distance from the ping servers, the latency varies. This gives us an idea what the ping would be if the servers of the target website are located near these places. The test results are not particularly impressive, as many of the proxies have a ping higher than 50ms. You can see the test results below. The second test that we performed on Proxy-n-VPN was a speed test. Although speed is not significant for many businesses, some businesses require many concurrent connections which may slow down a connection speed if the proxy server does not have good internet connection speed. Proxy-n-VPN claims that their datacenters are equipped with 1000Mbps internet connection which is pretty impressive. We tested the speed of the proxies using our own moderately fast connection speed of 52.13 Mbps. But, the highest speed after using the proxies dropped to only 2 mbps, which is not good at all. We can safely say that the service doesn’t pass the speed test. The proxy speed is very low and will definitely cause jitter even in your daily web browsing. Some businesses might find this okay with their work, but most will not. Our geolocation test was carried out to verify if the proxies provided by Proxy-n-VPN can really mask our location with their server location. In this test, Proxy-n-VPN passed with flying colors. For each proxy IPs, at least one of the two testing websites showed the same location as provided by ‘Proxy-n-VPN.’ We also confirmed that they provided us 2 European proxies and 8 USA proxies in our ten private proxies package. The eight proxies located in the USA were also distributed in 6 states, so the IPs were non-sequential which is a huge plus. The full details of the geolocation test of Proxy-n-VPN that we performed are given here. We also tested whether the general-purpose private proxy packages can access some high demand sites such as social media sites, Amazon, craigslist, sneakers sites, etc. Many websites, for which Proxy-n-VPN has dedicated proxies, are pre-blocked by the proxy server. So, the general-purpose proxies cannot access sites such as Craigslist, Nike, Adidas etc. However, we found that most other sites are accessible easily. Proxy-n-VPN has dedicated packages for Craigslist and Sneakers sites, so if you want to access the sites, you can buy those packages. Proxy-n-VPN lets users request for a reshuffle of the proxies. You can request for a refresh of proxies by going to the proxy control panel and then filling the Proxies Change Form. If eligible for new proxies, you will be issued new proxies within minutes. However, there is no auto proxy refreshing each month. Proxy-n-VPN supports dual authentication method for its proxies. For IP authentication, you’ll need to authorize your current IP on the Proxy-n-VPN control panel to be able to use the proxies. For username-based authentication, you don’t need to make any change on the control panel. But in both the cases, you’ll need to configure the proxies on the browser/application. The list of proxies can be downloaded in IP:Port:username:password format, which is very helpful since most applications use this format while adding bulk proxies. Proxy-n-VPN does not let you try their proxies for free before you buy. Instead, they have a refund policy. You can get a refund of your purchase if you have not used the proxies. The catch is, if you have used the proxies after purchasing and then found out that they are not a good suit for you, you will not get a refund. This is admittedly not a good refund policy and does not keep users in mind. Proxy-n-VPN has a total of around 30 proxy servers in the USA and Europe, 3 of which are in the UK and France. 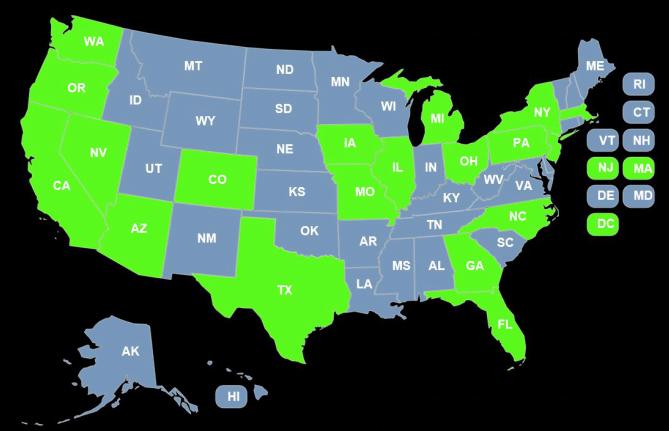 The USA proxies are distributed across 20 states, covering almost all of the country. Their servers are highly equipped as well. However, they don’t mention if it’s possible to get proxies from specific locations after purchase. The server configurations of Proxy-n-VPN are quite impressive and especially suitable for as proxy servers. Paired with server grade processor and RAM, they also have high-speed internet connection for a flawless browsing experience. Does Their Proxies easy to use? Signing up for Proxy-n-VPN is very easy. You can easily find the list of packages offered by Proxy-n-VPN on their homepage and from the navigation menu. After choosing a particular package, you can checkout easily by filling up a form. You will receive the proxies instantly which are usable as soon as you are ready. Proxy-n-VPN accepts payment via PayPal and Credit Cards (via 2checkout). It is possible to choose either IP authorization or username authentication easily from the control panel. For IP authentication, a maximum of 3 IPs can be authorized at a time, which we believe may be insufficient for many. Irrespective of the authentication method, the proxy network configuration settings is the same. The proxy settings are usually found inside the settings of the internet application. Add the proxy IP and port number given by Proxy-n-VPN under the manual proxy configuration. For username authentication, you’ll need to enter your username and password, whereas, for IP authentication, you’ll need to authorize your IP address in the control panel. You can also use your smartphone to use the proxy. The settings to configure proxies is found inside the Wifi settings. After our thorough test of ‘Proxy-n-VPN,’ we cannot say we are absolutely satisfied with their service. It did not perform well in our ping and speed test but passed marginally in the geolocations test and IP compatibility test. The lack of choosing specific locations, custom package plans and unfriendly refund-policy may not be well suited for many. Although Proxy-n-VPN has been around for quite some time now, they need to update some of their critical services which will only help them in the long term.